Tickets for the inaugural Rifle Farm to Table Dinner are on sale through Friday. Where: Bookcliffs Arts Center, 1100 E. 16th St. Ticket can be purchased through Friday at the Rifle Farmers Market, Miller’s Dry Goods and the Whistle Pig Coffee Stop & Cafe. Organizers of an inaugural dinner featuring local food and drink are hoping it will grow into a recurring event that, if successful, could help make the Rifle Farmers Market more self sustaining. Tickets for the inaugural Rifle Farm to Table Dinner, planned for Sept. 10, are on sale through Friday. So far, sales have been slower than hoped for in this first year of hosting such an event, said Cathleen Anthony, farmers market manager and assistant to the Greater Rifle Improvement Team. As of Wednesday morning, 27 of the 100 available tickets had been sold at the market, although a good number of people have expressed interest, Anthony added. Tickets are $55 for one person or $100 for a couple, and they can be purchased at the Rifle Farmers Market, as well as at Miller’s Dry Goods and the Whistle Pig Coffee Stop & Cafe in downtown Rifle. Proceeds, if there are any in the first year, will go to the future continuation of the Rifle Farmers Market, which has relied heavily on grant funding in the past, according to Anthony. 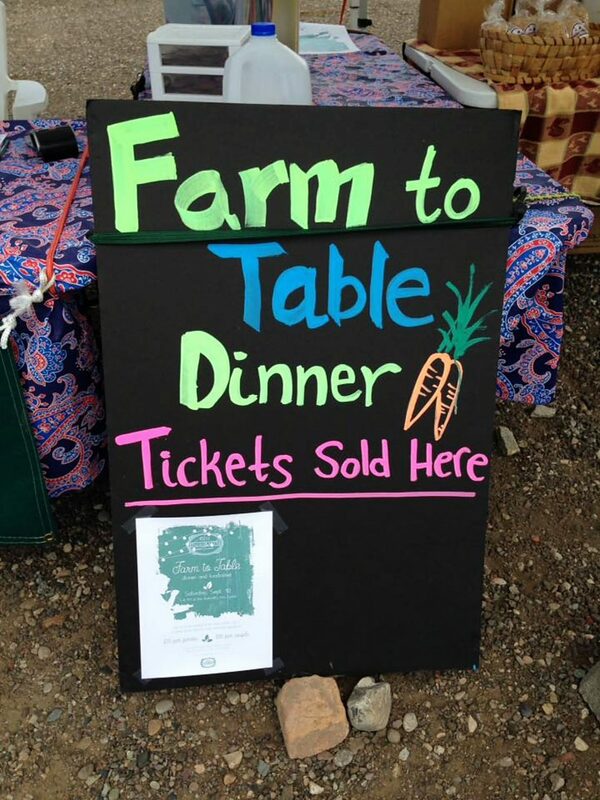 The idea for the farm to table event started earlier this year after Hannah Klausman, a member of the farmers market board, saw an article about a similar event in Tennessee that raised a substantial amount of money. “The thing that got me on this guy is they raised $10,000. … I saw that and I thought ah ha,” Klausman said. The hope, Anthony continued, is to build the dinner into an annual event with enough support to not only break even, which admittedly might be a challenge in the first year, but to generate enough money to help make the farmers market more sustainable. The dinner, which is being hosted at the Bookcliffs Arts Center, will feature four courses of locally sourced food, as well as beer from Glenwood Canyon Brewing Company. Grand River Health is donating beef purchased at the Garfield County Fair and Rodeo, and Rifle Farmers Market vendors were asked for produce donations. Six vendors committed to making donations, and in exchange they will receive two free tickets and an opportunity to speak about their contribution when it is served, Anthony said. Sarah Naef, executive chef for Grand River Health nutritional services, and Elissa Nye, catering manager at the Whistle Pig, are preparing the meals. “I instantly jumped on board because I think it’s a good idea and I want to see more things like it in Rifle,” Nye said. The final menu is still being set, but Nye said the appetizers will likely consist of donated produce and some sort of dip, such as humus. Goat cheese donated by Avalanche Cheese Co., of Basalt, also will likely be worked into the appetizers. A traditional caprese salad will follow the appetizer course, with a main course consisting of the beef donated by Grand River. Dessert will be prepared by the Whistle Pig’s Andrea Matthews.